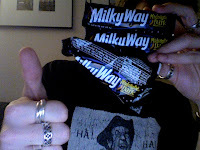 Milky Way Midnight Dark is the best candy bar ever, and the only one that's even better if you eat it at night (they're not paying me to say that... yet). They're so good that I ended up eating one before I got to take this picture. But yeah, the store had them for 33 cents each, so that's why I have so many.